These bite-size shortbread tarts make the most amazing and impressive desserts. Buttery shortcrust pastry that’s tender and crips. 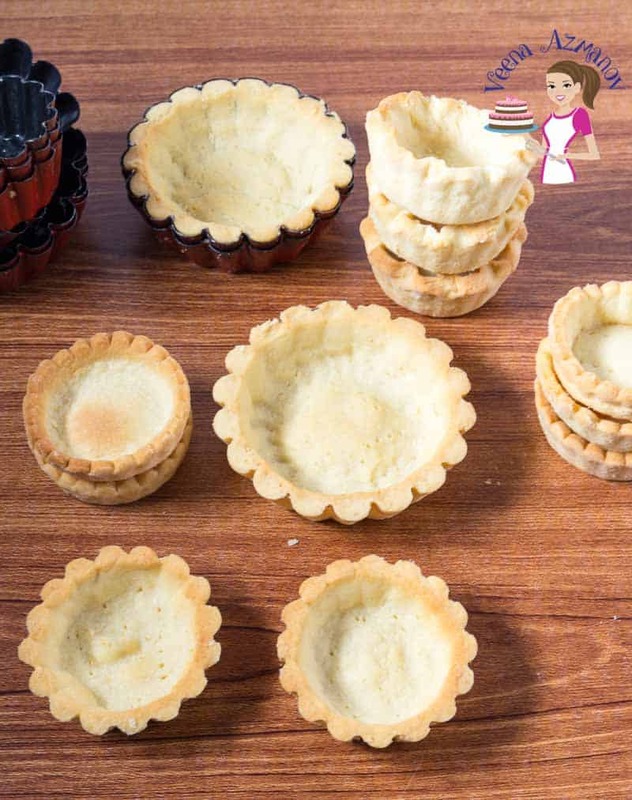 Today, I’m going to show my super simple and easy methods to make these homemade mini tart shells. 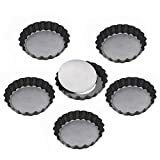 They are a perfect base for any filling from sweet custards creams topped with fruits, mousses or ganaches. Homemade mini tarts will be your next new favorite homemade treats. If you want to impress family and friends make them a delicious tart. If you want them to envy, you make them some mini tarts. Often people think mini tarts are works of art that are difficult to make. They indeed are works of art but not really difficult to make. 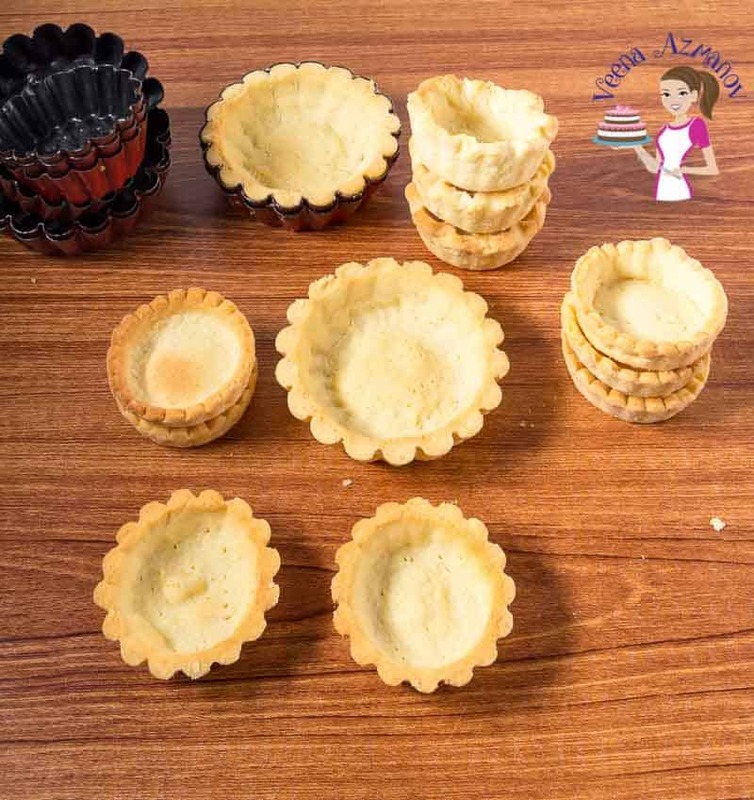 Save this recipe and tutorial as I am going to show you how simple and easy it is to make homemade mini tart shells. Once you get started these get done in no time. These are so pretty when filled with seasonal fruits on a custard cream filling or a delicious mousse filling. The classic, most straightforward and most delicious of course, is filled with chocolate ganache or caramel. These can be made in advance and stored in an airtight container in the fridge for a week or in the freezer for up to a month. Which mean you can plan dessert ahead of time for your party. 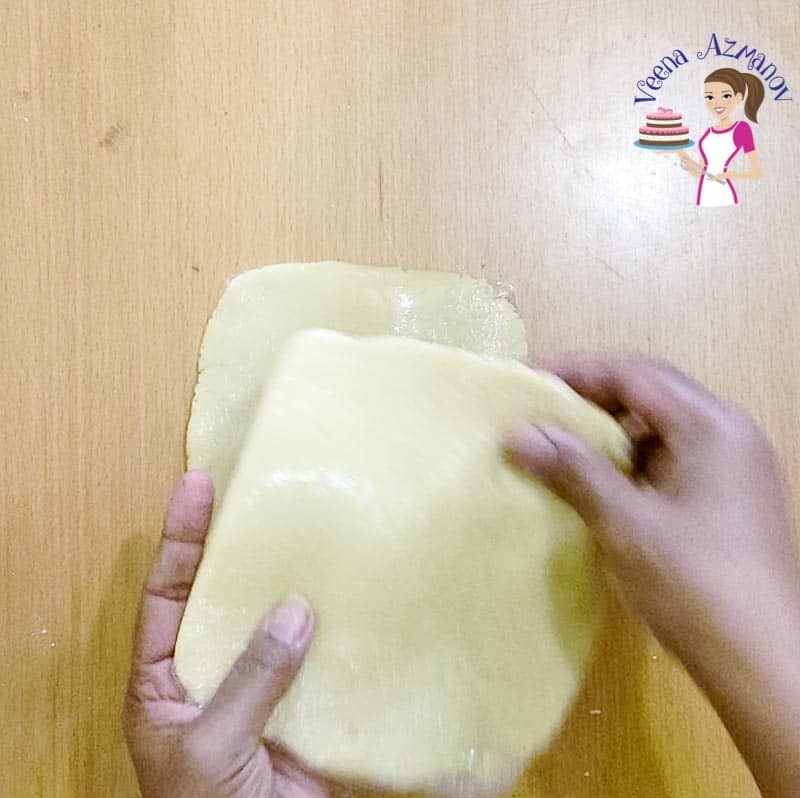 The dough is our basic shortcrust pastry dough which we use to make large tart shells. You can also use a pie crust dough and use the same method if you want to make min pies or mini quiches. 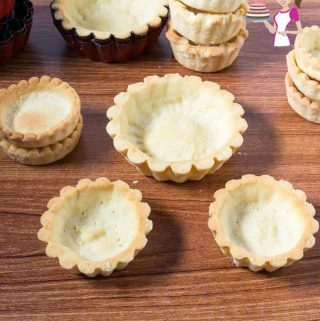 There are many ways to make mini tart shells everyone claiming to be easy. The truth is that everyone works differently so find the method that best suits you. If you don’t have mini tartlet pans like Ido, it’s ok. Just use a muffin pan and do the same method but in the muffin cups. Spray the muffin cups lightly with cooking spray for easy removal. 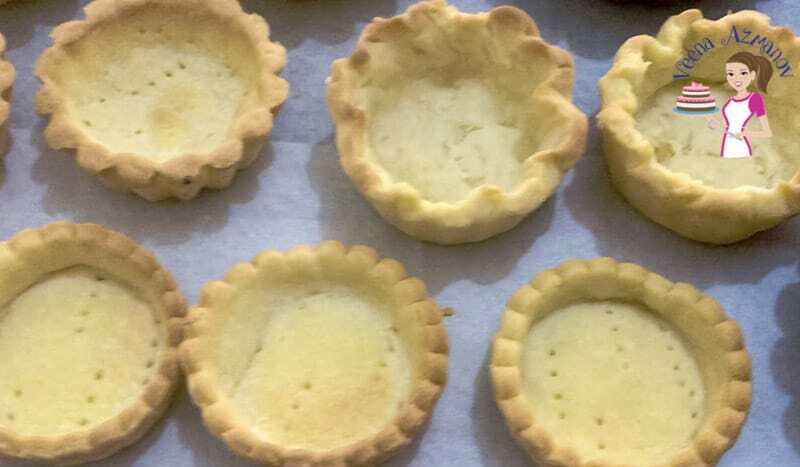 How to make mini pie crust? 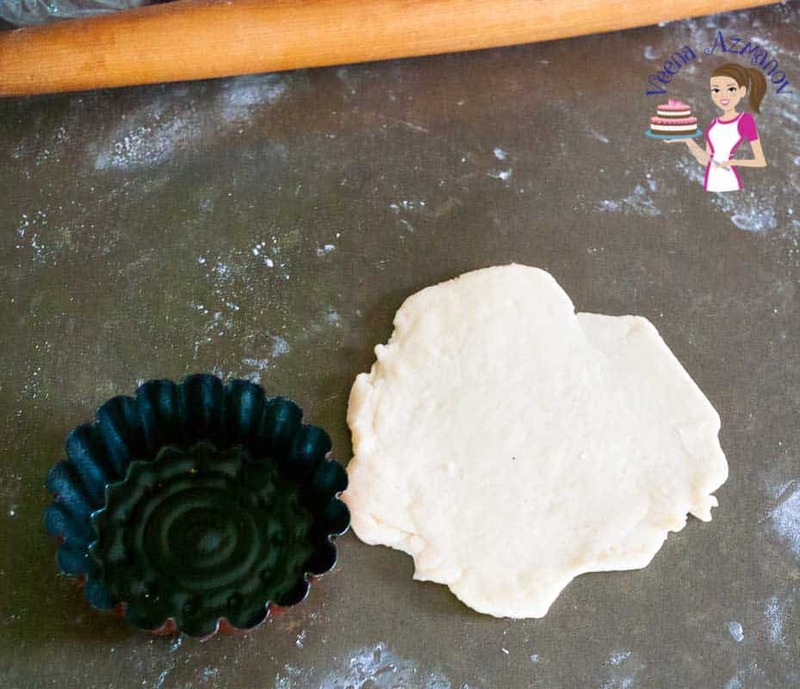 You can make mini pie crust the same way but with pie crust dough instead of pastry dough. If you do not have mini tart shells, you can also use a muffin pan. Grease each muffin cup with cooking spray, roll the pie crust on a lightly floured surface and gently lay the sheet into the cavity. Press down lightly, cut off any excess, prick the dough with the fork and bake for 8 minutes. 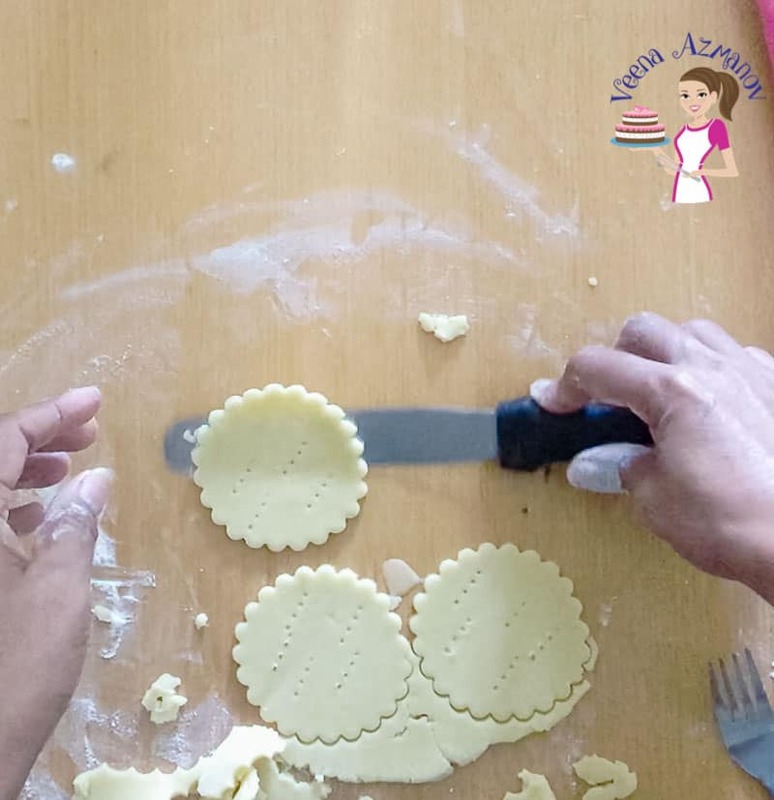 How to make homemade tart shells? 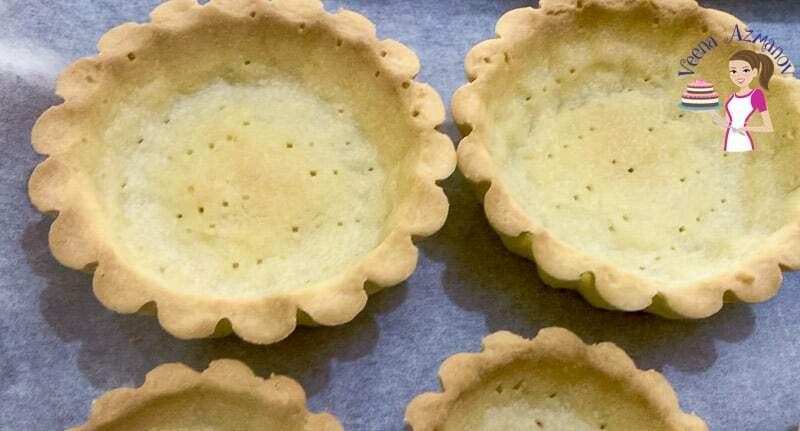 Surprising as it sounds making homemade tart shells are easy. Follow the step by step below for recipe and instructions. 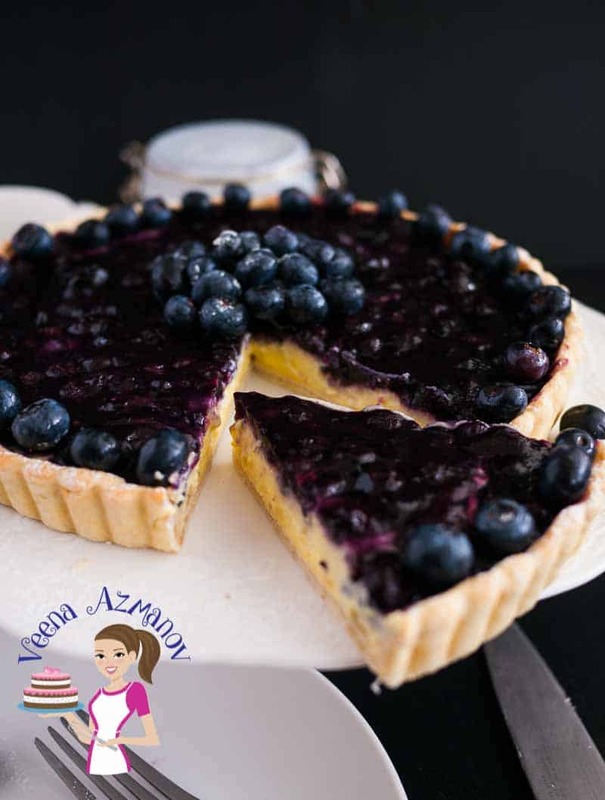 A mini version of a tart is called a tartlet and usually made with shortcrust pastry for the dough, and a sweet filling. 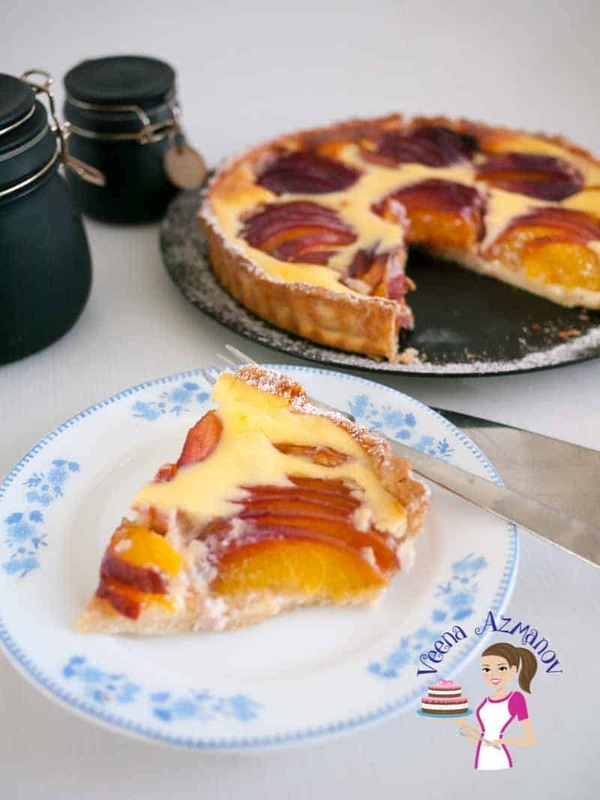 Often a fruit-based mini tart is referred to as a tartlet. 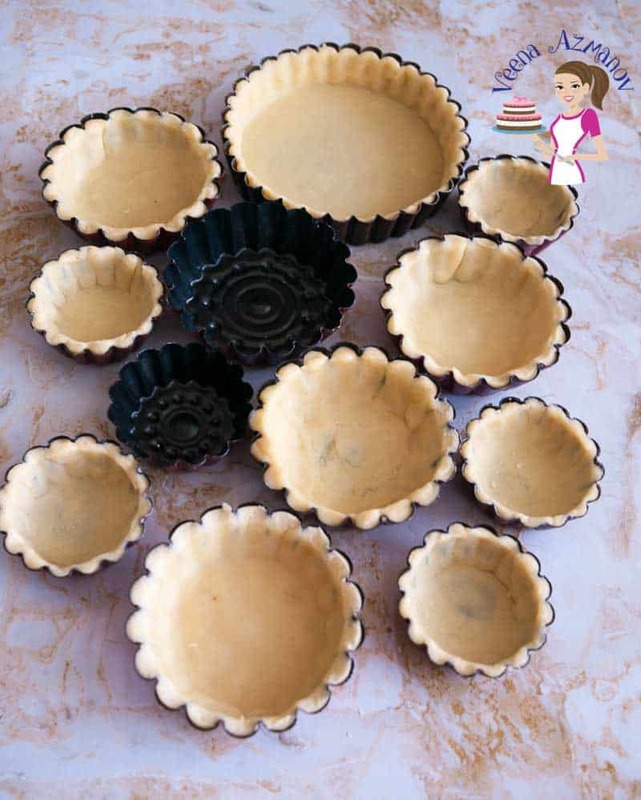 How to bake pre-made tart shells? How do I know if my pastry is baked? Often people see light brown edges and presume the crust is done. No. The pastry is baked when the bottom is cooked not when the edges are browns. 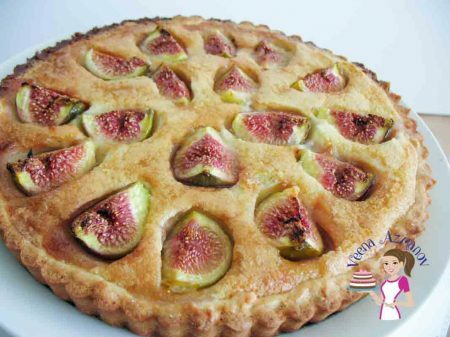 Always make sure the bottom of the crust is cooked or any filling will soak into the crust and make the tart soggy. If the edges are browning too quickly – tent the edges with foil or pie crust shield. 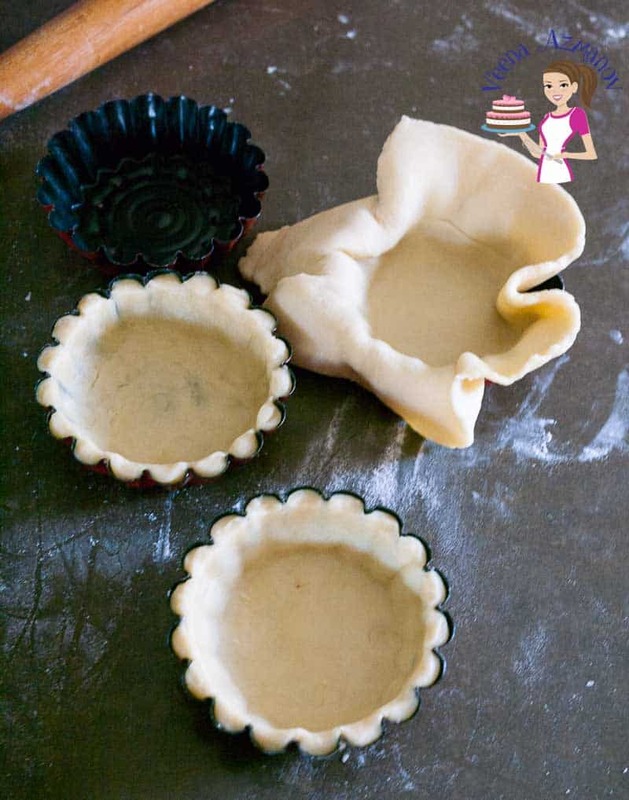 How do you store baked tart shells? 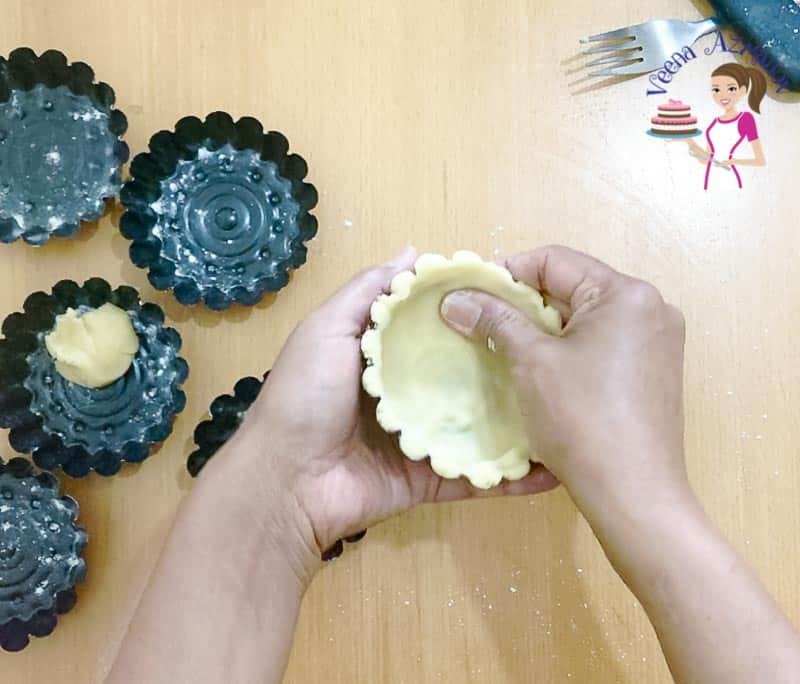 Baked tart shells are best stored in an airtight container in the refrigerator for up to 4 days or you can also freeze them for up to a month. Butter – you want to use unsalted butter – the color of your butter will determine the color of your pastry – I’m using a pale white butter. If you can’t find unsalted butter go ahead and use salted butter but omit the additional salt in the recipe. Egg Yolk – This is important as it gives the pastry that crumbly biscuit-like texture. Chilled water – We need to keep the butter in the pastry cold at all times until baking which is one reason we use chilled or ice water. Also, we use very little water because our goal is to keep the pastry crumbly. Adding more water will take that crisp texture away and give us a tight dough. Often some of my students substitute milk or cream for the water in their sweet pastry crust. I advise against it -Why? 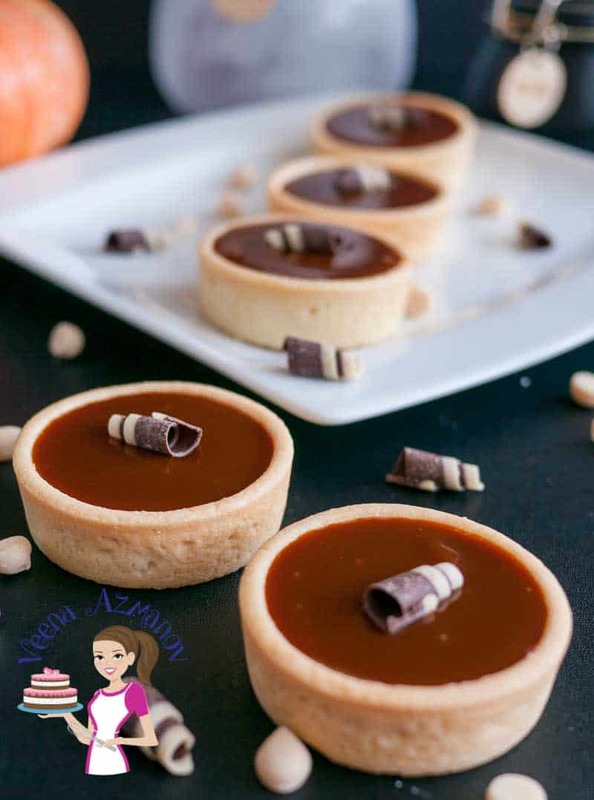 The sugars in the milk and cream make the pastry caramelize during baking giving you a dark pastry crust. I prefer a light golden color. Sugar – This is a Pate Sucre’ aka shortcrust pastry; so yes we do need to add sugar, however, if you prefer you can add less or more as desired. Always keep the filling in mind when altering a recipe. Remember the result is a thin pastry crust that’s filled with goodness. The pastry blender is a great tool to have if you plan to make pies often by hand. I love using my food processor to make any kind of pastry. It takes minutes and the butter is evenly distributed giving you a nice uniform bread crumb consistency. Never use an electric mixeras it will cream not pulse the dough. 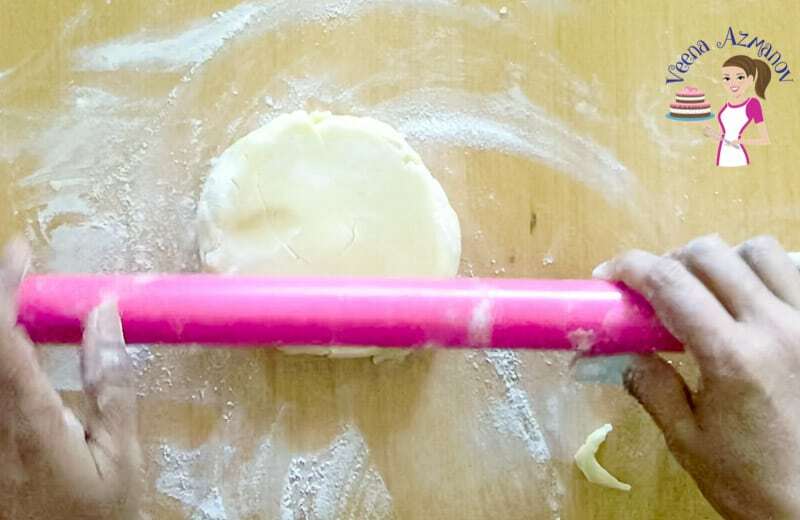 I use my French rolling pin but any good pastry rolling pin helps as long as you can roll it smooth and evenly. A pie chart rolling matis a great guide to have for beginners who are new to baking. This takes the guesswork out if the dough has rolled big enough. 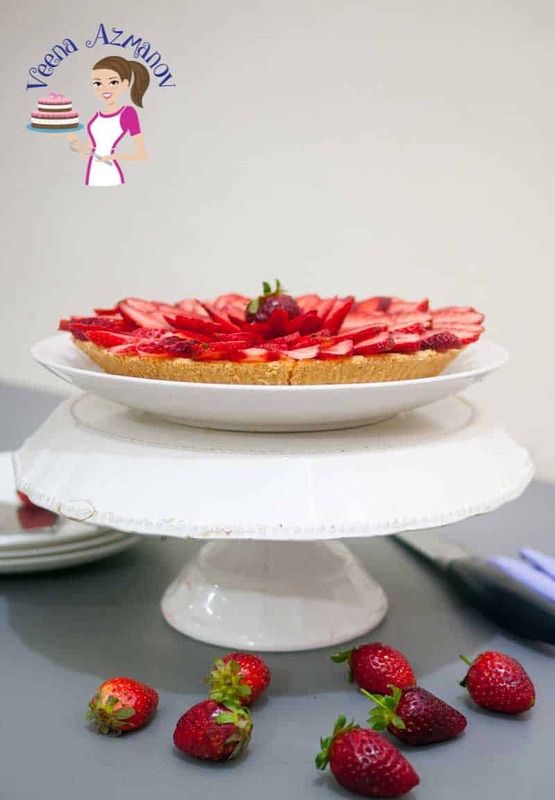 A 9-inch tart pan make a good size dessert for a small family of four and a 10-inch tart pan is a good size pan for a larger family of 6. A 7-inch tart pans and5-inch tart pans work great when you want to gift family and friends. I have a set of six 5-inch pans which work great when I want to give desserts like pecan pie during the fall seasaon. Wrap the dough in cling or plastic wrap to chill before you roll it. If you plan to freeze the dough always wrap it again in a ziplock bag or freezer bag to prevent freezer burns. Pie weights work great when you need to blind bake a pastry. Although you can use any baking beans like dried beans. My pie crust shield was a great investment so I don’t have to struggle with covering the edges with foil. Ensure the butter is chilled – cut into cubes. Measure the flour, salt, and sugar in a metal bowl. Leaving the bowl in the fridge for an hour will help keep the dough cold. Use a fork, pastry blender or your fingertips to cut the butter into the flour. When using your fingertips be gentle, squishing the butter, flattening them cubes in the flour. The mixture starts with larger crumbles, and as you continue, the crumbs become smaller. Continue until you have a crumbly mixture similar to coarse breadcrumbs. Add the egg yolk and try to incorporate as much as you can. Lastly, add 2 tbsp chilled water bringing the crumbs together. Add more water only if needed to bring the dough into a ball. Wrap in cling or plastic wrap and chill for at least 20 to 30 minutes until firm enough to roll. Measure the flour, salt, and sugar in the food processor. Pulse 3 to 4 times – stop – pulse again 3 to 4 times. Pulse until you have a crumbly mixture similar to coarse breadcrumbs. Add the egg yolk and give it a few more short bursts. Lastly, add 2 tbsp chilled water thru the feed while still processing. This will bring the dough together. Open the dough and roll carefully from the center out turning as you go. With the help of a glass or cup that fits inside the muffin cup gently place the pastry in. This object will help define the tartlets. Chill in the fridge while the oven is preheating. Flute the edges if desired with your fingers as shown in the video. Cut small 6-inch size parchment paper disc and crumble into a ball just enough to stay inside the pastry. The parchment paper prevents the sides from collapsing in the center. Take small golf size amount of chilled dough. Using your fingertips – lift and press the edges. This makes the edges thicker so they don’t brown quickly but also prevents breakage. Prick the pastry all over with the tines of a fork or cocktail stick to prevent the dough from puffing. 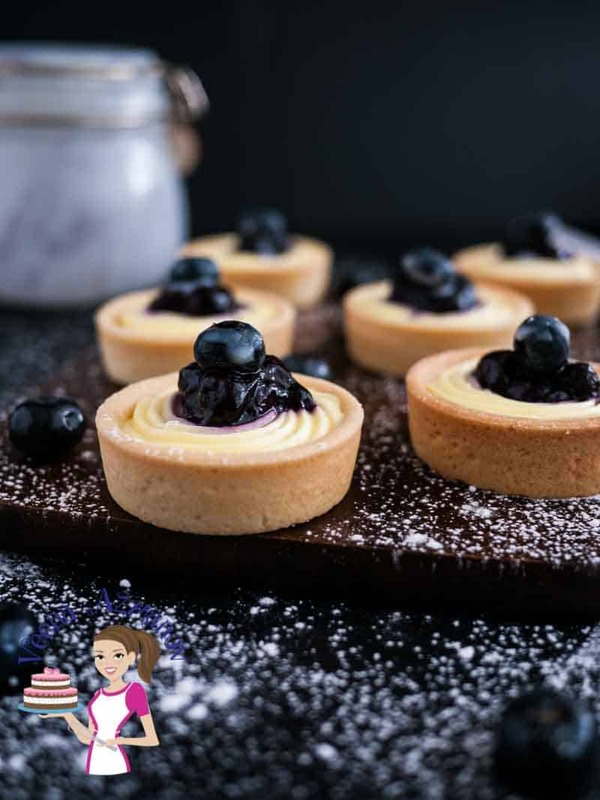 Bake in the preheated oven – the 3-inch mini tarts take 10 to 12 minutes while the 5 -inch mini tarts take about 12 to 14 minutes. Chill the mixing bowl and pastry ingredients including cubed butter an hour before you start making the pastry. This will give you a beautiful tender crust. Fat is the essential ingredient – Always use high-fat ratio lard, butter or vegetable shortening. Chill it thoroughly before you add it to the flour. The flour, when coated with fat, prevents gluten formation. When it comes to liquid a little goes a long way with pastry. So add water by the tablespoon, don’t pour. Have all your pastry equipment on hand before you start making any pastry so you can work quickly and efficiently. 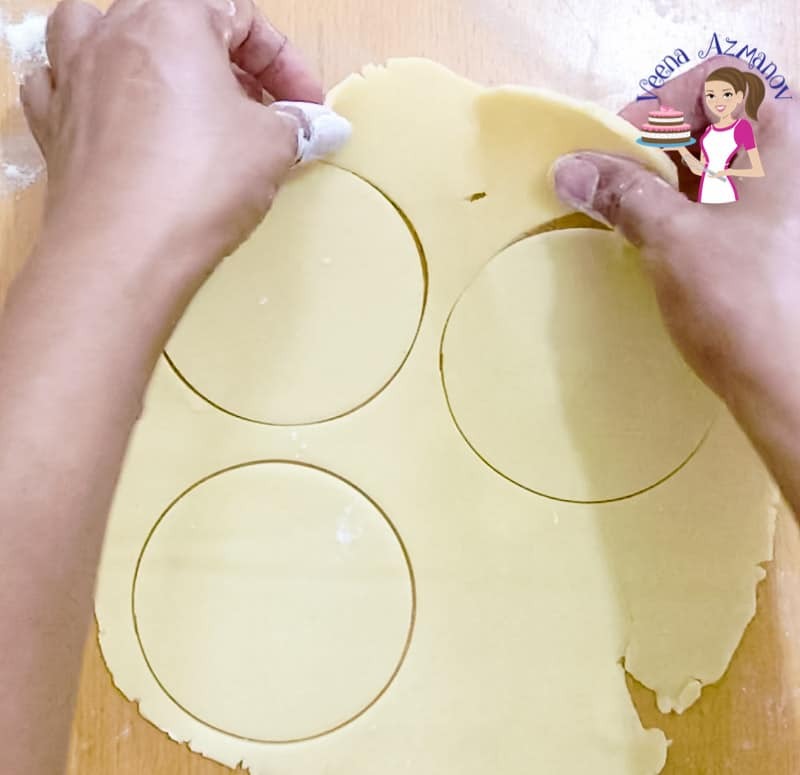 Rest the dough in the fridge before you roll pastry no matter how soon you need it- this will help the gluten in the dough relax, chill the butter and keep the pastry crumbly. If the pastry dough is cracking too much it means it’s too cold, let it rest a few minutes outside the fridge then roll again. Chill the dough before you bake the pastry again to prevent shrinkage. Always use a hot oven this will again prevent shrinkage. A cold oven will melt the butter rather than cook it. The pastry is baked when the bottom is cooked not when the edges are browns. Always make sure the bottom of the crust is cooked or any filling will soak into the crust and make the tart soggy. If the edges are browning too quickly – tent the edges with foil or pie crust shield. 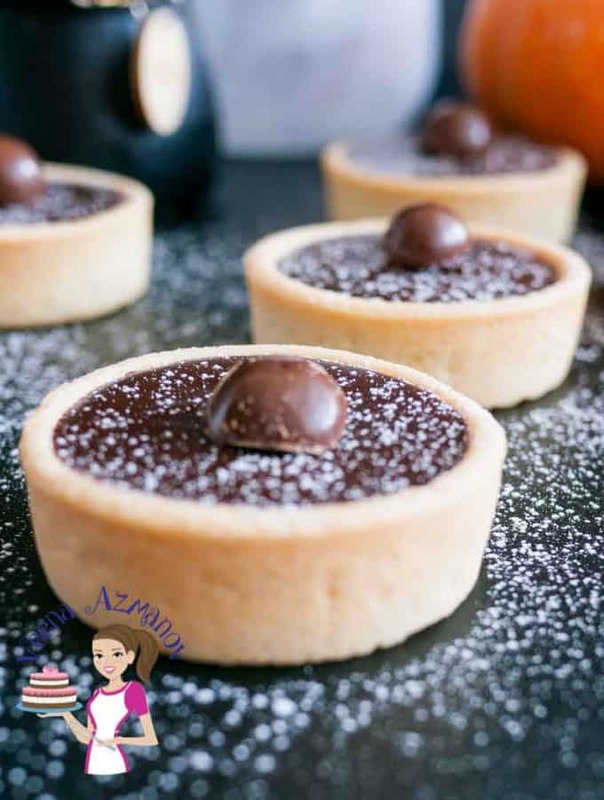 Homemade mini tarts make impressive bite-size desserts. 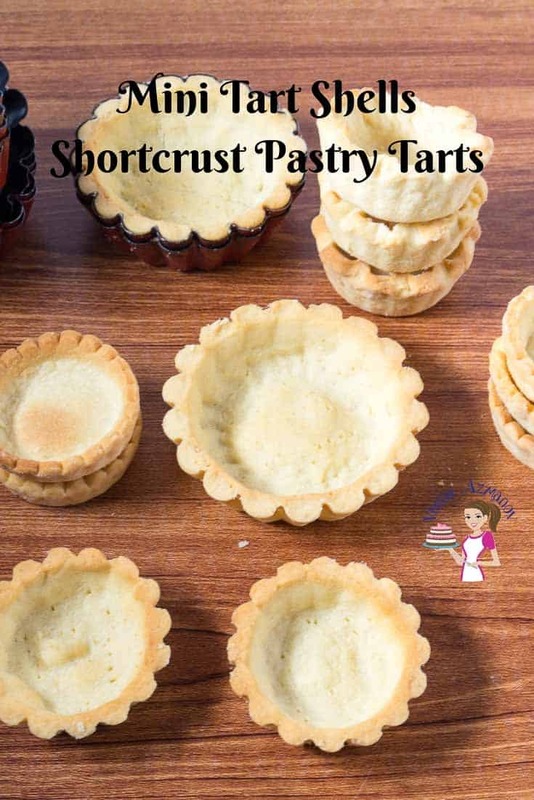 Today I'm going to show you how I make these shortcrust pastry tarts or Mini Tart Shells using a simple and easy recipe and method. Perfect to fill with mousse or creamy custard studded with fruits, ganache or caramel. Ensure the butter is chilled - cut into cubes. Pulse 3 to 4 times - stop - pulse again 3 to 4 times. 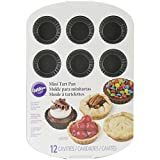 Bake in the preheated oven - the 3-inch mini tarts take 10 to 12 minutes while the 5 -inch mini tarts take about 12 to 14 minutes. These mini tart shells are so cute. I actually never done any tart before. It’s very complicated to make – for me, at least that what I thought. Till now. Your step by step instructions are very helpful. Can’t wait to try make it! Thanks, Natalie. It’s not complicated at all. You must try these. You make these look so simple! 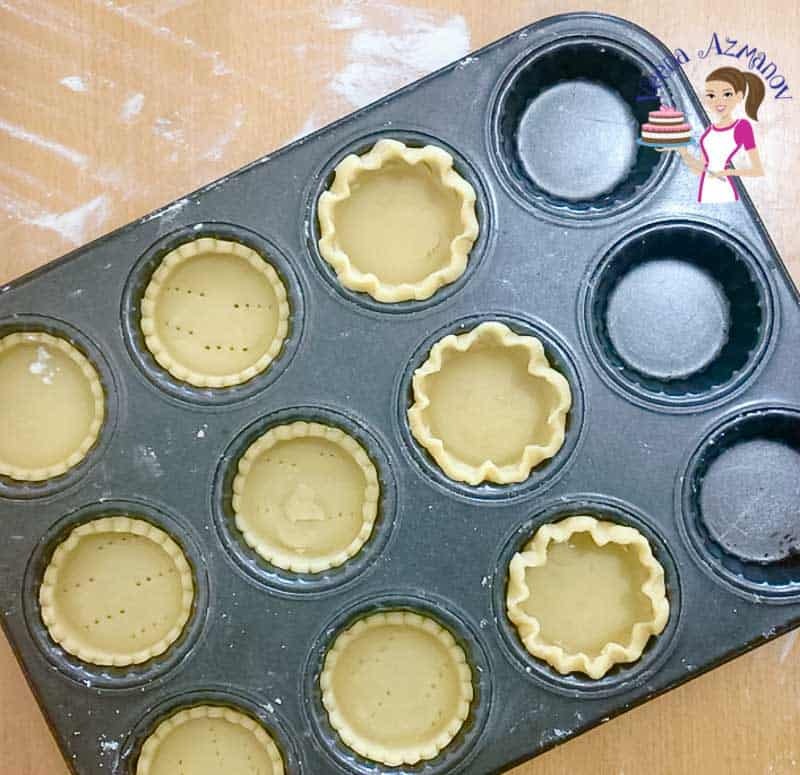 I’ve never made mini tart shells before but always wondered how you get them out of the little forms! Thank you, Glair. The come off the little forms very easily because they are butter based. These are such cute little crusts! I can think of so many different things I could fill these with. Your posts are always so informative! I love it! These look so fun! My daughter would love to make these! She’s never made anything like these before. Thanks for all the tutorial steps! Thank you, Amanda.Glad you like my posts and find them useful. I think you daughter will have fun with these. I love these little shells! They look so easy to make too. Thank you for sharing. I’m simply amazed!! I love how they turn out. One of my most popular pins wasn’t even mine. It featured a tart shell recipe I shared. I swore I’d duplicate but make my own shell. You are so creative. I can’t imagine where you get the time or the ideas to come up with so much. I feel guilty when I say I don’t have time. I’m definitely making these. I’ll be ordering from Amazon soon to get the shell forms. Thank you Marisa. These do not take long really. I can’t believe how incredibly easy you made this recipe look to me!!! I’m pinning because I’m definitely going to try it…maybe for my niece’s bridal shower in May! 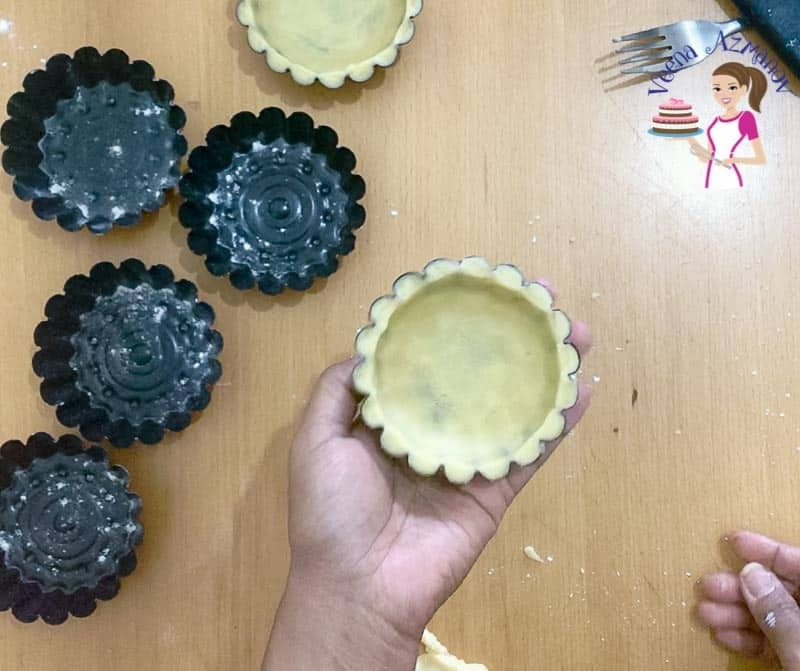 I just love making tartlets and mini pies! I make them so often! Thank you for all the tips! They do help in making great shortcrust pastry. Beautiful! OMG I can’t wait to make these!! 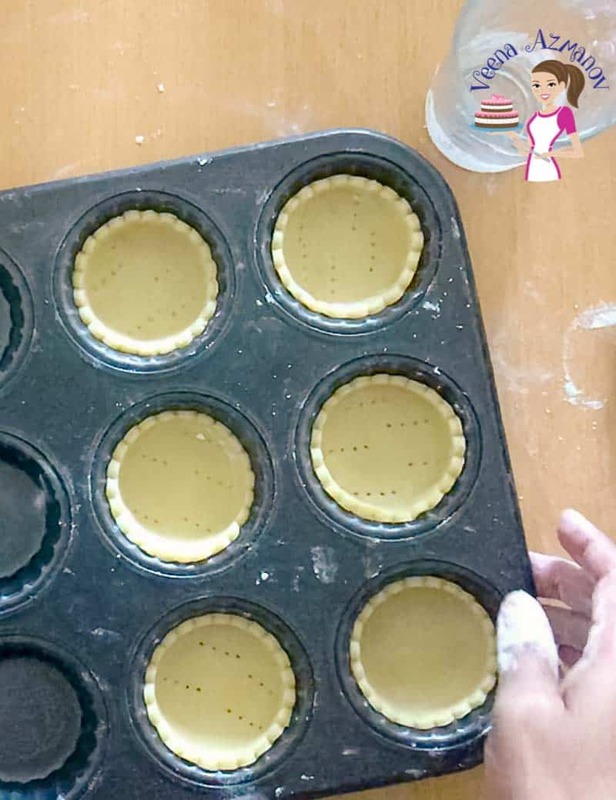 I have lots and lots of mini tart pans and moulds (all shapes and sizes lol) that I bought years ago but are now gathering dust because I just got too lazy to make homemade crust/shells. As always you make them look so easy! Thank you, Jolina. I know what you mean. I am often lazy myself. I hope you will try these. They are so easy. I am making tarts for Valentine’s Day dessert. I have already printed this recipe out and put it with my menu plans. Just what I was looking for. Awesome. 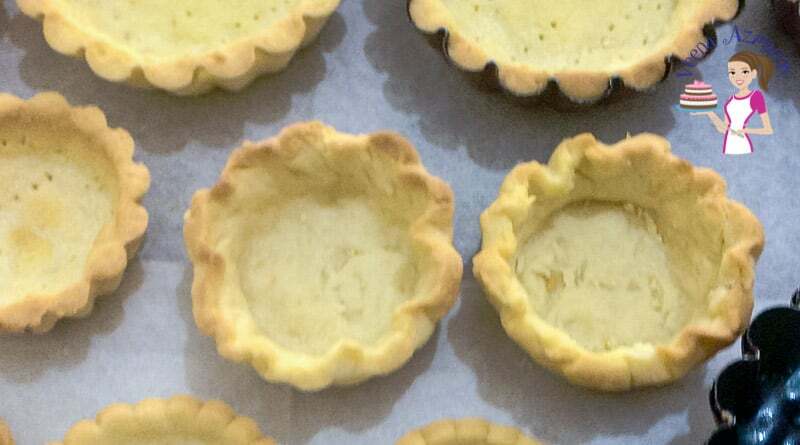 I never realized how easy it is to make tart shells. There really isn’t a good reason to buy them premade. They are so easy Arlene. Thanks. I went back up and looked at the nutritional information and these are pretty low carb to begin with! Can’t wait to give them a try! I so admire your baking skills! These are so adorable and delicious looking! I want to try to make low carb mini pies one day soon, so I’m going to come back here and get a refresher. I know they will taste terrible compared to yours but I want to give it a try. Wish me luck! I love all the low carb stuff you do Denise. So challenging to get things low carb and still taste good. Thanks for all the great tips! I can’t wait to give these little tart shells a try. Wow they are wonderful! I want to try your ideas as soon as possible. is so simple. Thank you for sharing this with us. 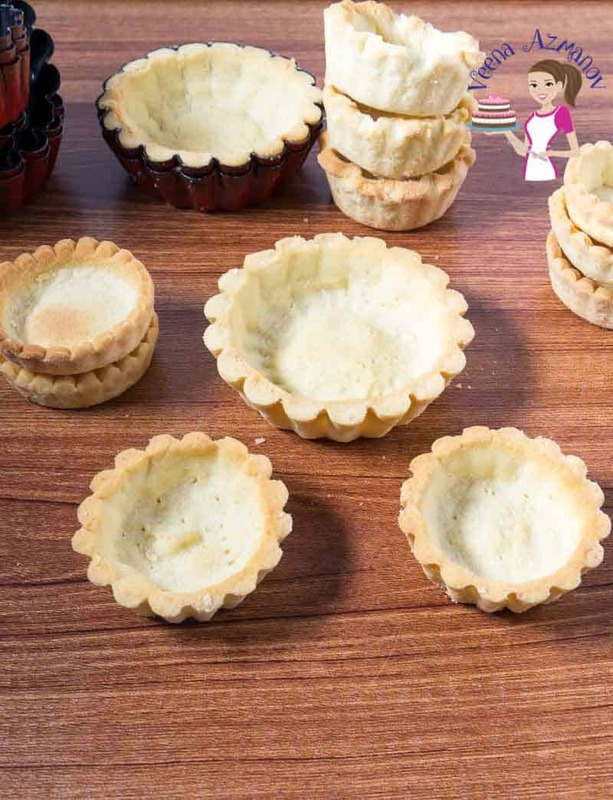 Your easy to follow directions make these mini tart shells impossible to mess up. Thanks for sharing! 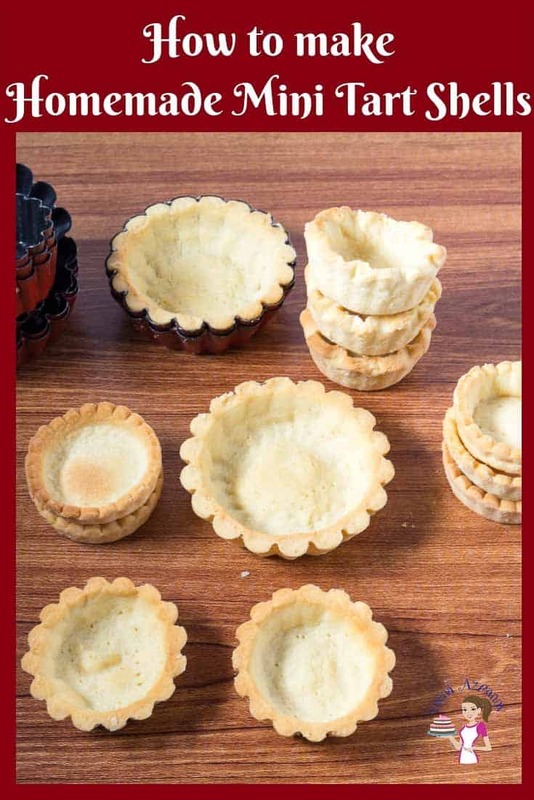 These mini tart shells are so great! 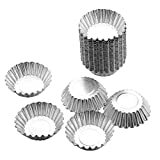 Make these up and fill with all kinds of fillings, the possibilities are endless. 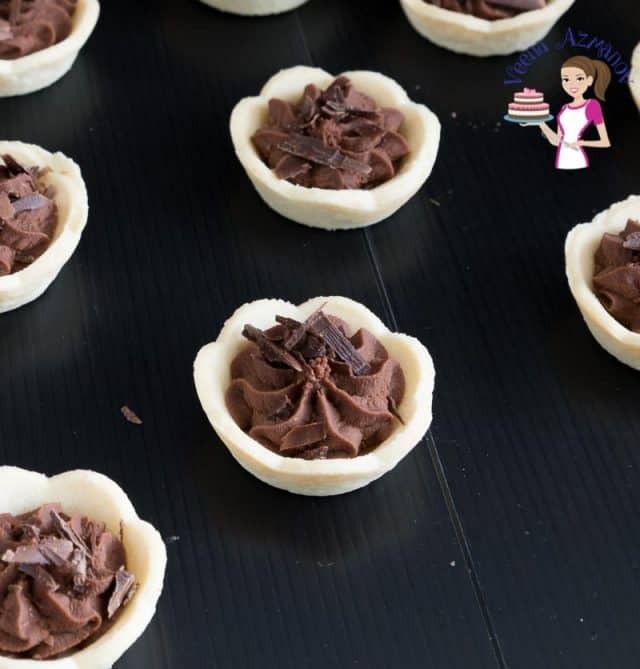 These mini tart shells are so cute! Thanks for sharing your methods and tips! I always try to make my own pastry when possible, it’s just so satisfying to make everything from scratch! Some great tips there, thank you for sharing! Thank you, Carrie. Lemon meringue is delicious in these. 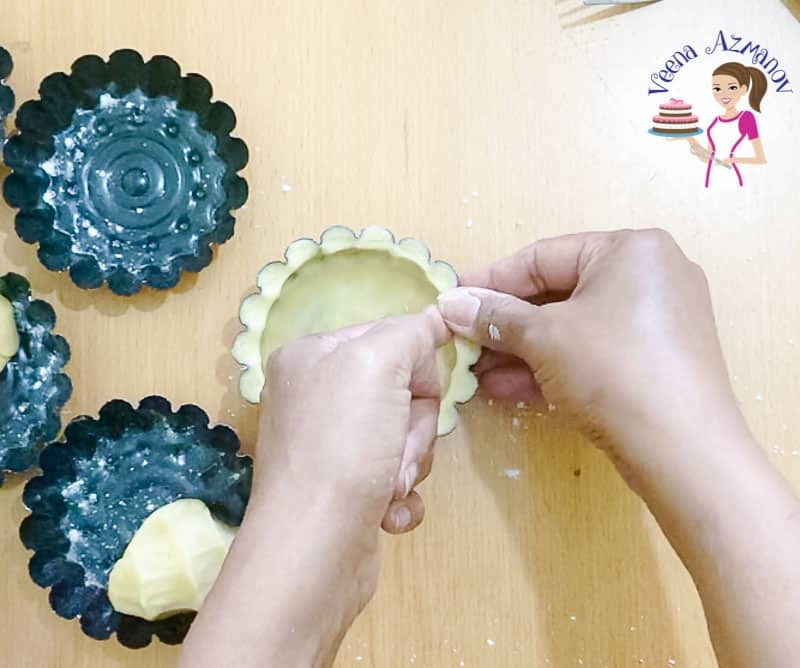 I want to make your mini tart shells! I’m so glad I found this recipe since I just bought some tartlet pans. Great instructions and they look perfect and delicious!